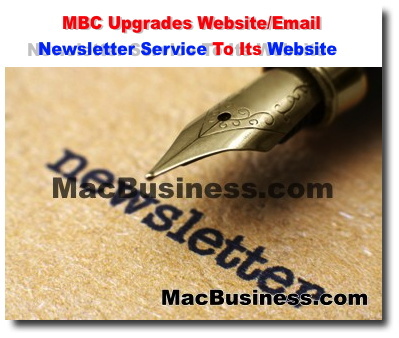 MacBusiness Consulting is proud to announce the addition of MBC Website/Email Newsletter Service to our Website Solutions Package. We at MBC know that it is critical for our clients to execute and maintain newsletter/Email campaigns on a regular basis. Many successful companies maintain a consistent level of communication with its customers and prospects using newsletters/Emails. When done right, it allows companies to maintain a relationship without being too invasive yet still being there when the timing is right. We have developed a technology and a methodology that automates the creation, maintenance and execution of multiple newsletter campaigns for our clients. This automation empowers us to give this service to our website solutions clients for FREE and at a very low charge for clients not using the MBC Website Solution. We then execute a personalized broadcast Email of your newsletter to your mailing list using the MBC Emailer. We also publish your newsletter on your website and apply search engine optimization to the webpage. No monthly fees. Some companies charge between $50-$100 month to maintain a active Email list. SEO Enhancements - Our Search Engine Optimization techniques improve the visibility of your website in popular search engines such as Google.com. MacBusiness Consulting has hundreds of happy clients. See what they have to say.